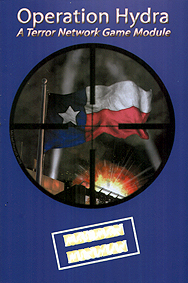 The War on Terror has hit American soil, and the enemy takes aim at Dallas, Texas. The clock is ticking as an Al Mahara terrorist cell plots a deadly attack in this exciting Operation. Agents scour Dallas for leads in an effort to stop the terrorists before it's too late. Designed for 2-6 players, Operation Hydra is the first module for the Terror Network game system. It comes complete with a detailed map of Dallas, instructions for running the operation, and an array of suspects. Your players will be thrilled, challenged, and excited for more, as they confront the dangers of Al Mahara in this captivating module. Suitable for Novice to Experienced Agents.